Oh. My. Goodness. Either I was seriously craving eggplant like, super bad, or these were just out of this world delicious. Vegetarian Times had a recipe similar to this today, but I didn’t have time to make it like they did, so I did it the Veggie Diva way! And they were SO easy to make, too! I was in a rush and quite anxious to get food made fast, so I used my little George Foreman grill to whip these up in like 20 minutes instead of firing up the gas grill outside. They are amazing with a little balsamic vinegar drizzle and fresh ground black pepper sprinkled over the top. I give this one 10 out of 5 stars :-) !!! Turn on your George Foreman Grill to medium/medium high heat. These little things heat up super fast though. Cut the stem off the eggplant, then slice it vertically from stem to bottom into 1/2 inch thick “steaks.” On a regular dinner plate, mix together vinegar, soy sauce, oil, pepper and garlic powder. Coat both sides of each eggplant steak with the vinegar and oil mixture by moving it around gently until it’s coated well. Repeat for the other side. 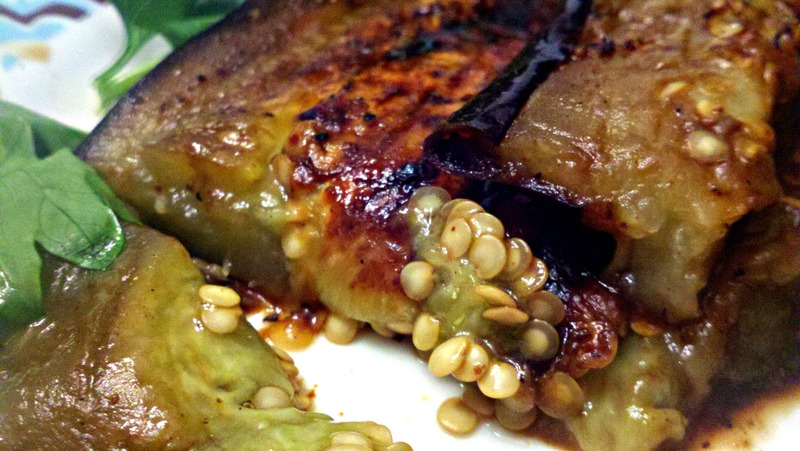 Place eggplant steaks on the grill and let them cook until they get those lovely grill marks. I still had to flip my steaks even though the little grill heats from the top as well; the bottom seems to cook and brown them better. I let them cook until they were soft and the grill marks were quite brown. Serve with a drizzle of balsamic vinegar and a dash of fresh ground black pepper. A great entree! Makes about 6 servings.